I’ve lived in a lot of different places by now. I moved every year through college and seminary, I’ve owned two homes and rented several in between. I’ve traveled to Europe, Asia, the Caribbean, the Middle East and all over the US, and I’ve lived in 6 different states. I’ve loved it all – discovering new cultures, exploring new terrain, meeting new people. And because I’m an organizing geek, I’ve loved finding ways to arrange my stuff in each new locale. But with traveling and moving comes some stress. There are new customs to decipher, procedures to follow, information that’s needed but can’t be found. It’s hard to start your day when you can’t find the basic necessities of life: towels, soap, toilet paper. And it simply takes a while to get used to a new place. So even as I seek out new adventures, I long for the comforts of home. One thing has always helped me find the balance between adventure and safety. Wherever I’ve traveled, wherever I’ve moved, I never feel right until I’ve found a place to run. When I’m running, I’m able to explore new places in a way that most tourists don’t. I’m up early and out the door as the shopkeepers begin their daily chores and the locals are walking their dogs. I learn which bars were the rowdiest the night before and which parts of town get overlooked by other travelers. But even as I get to experience something new on each run, I’m also returning to the safety of what I know: the way my knees creak during my warmup, the satisfaction of deep breaths, the rhythm of my stride that remains the same, no matter where I am. When I’m running, wherever I’m running, I am home. On Sunday I ran in that fabled city of runners, Austin. 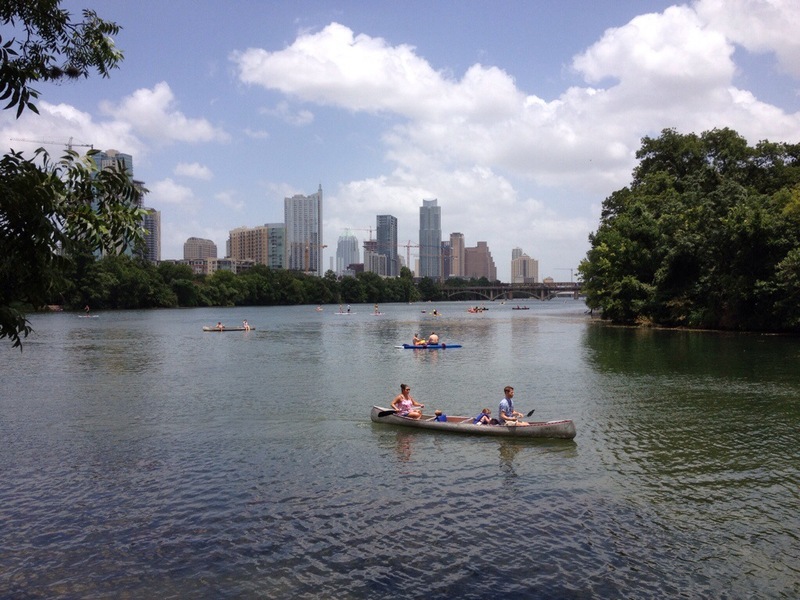 It was in the mid-90’s by the time I got to Lady Bird Lake in the middle of town. But I knew I needed this run, to remind myself of who I am, and so I took off into the humidity. I ran under the shade of trees that line the lake. And I partook of life-giving water from fountains generously located along the trail. I was entertained by the hundreds of kayakers and SUPers learning their new skills, and by the families with kids in various stages of grumpiness and irritability. And as I was buoyed by the crowd of runners braving the heat, I realized that once again, I had come home. I still can’t find the box that has my belts and scarves, and I don’t know how we’re going to get to the decorations in the garage come Christmastime, and who knows how long it will take to get my car and self registered and licensed in the state of Texas. But none of that really matters. Because I found a place to run.